Living in the life that you have always dreamed about doesn’t have to be a life that you only visit in your dreams. If there is something about the life you are living now that doesn’t suit you anymore, or doesn’t bring you ‘joy rising’, then change it. You are the one that is in control. If you are not in control of your life, then this would be your first step towards living the life you want. Gaining authority over yourself is a vital tool to owning your own power. Soul Work comes in many stages. Labouring through the process takes courage, trust and faith. There will be many tasks to undertake in order to achieve the results that you desire. Making change is one of the hardest accomplishments, because our Ego hates the very thought of change. Our Ego rules our mind thoughts. The very place in our brains that is programmed to keep us caught up in our conditioning. Thinking outside of the societal box is a scary place to visit for any of us, and is the very cause of what holds us back from living our true potential. 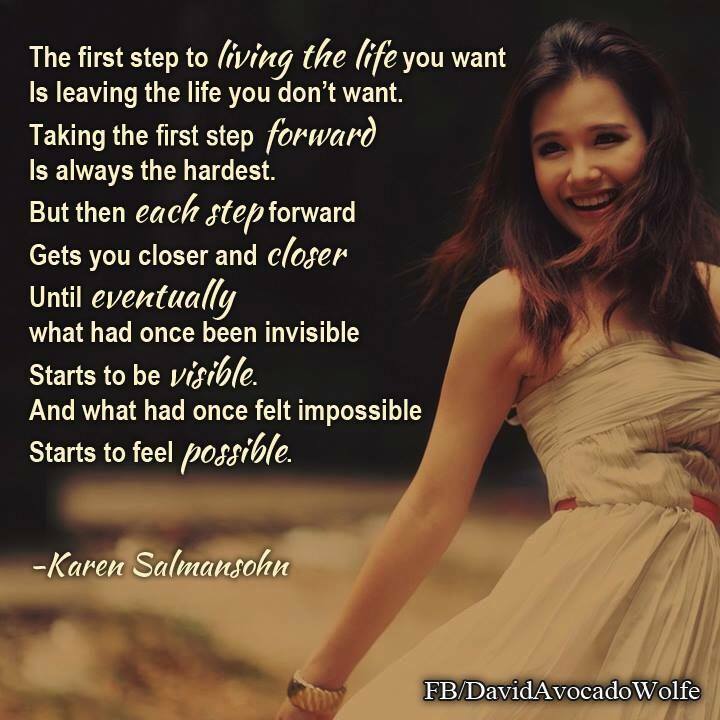 So how do I put that ‘one foot forward’ to living the life that I have only dreamed about? It is simple, make a commitment to yourself. Make a promise to ‘you’ that you will begin to take care of ‘you’. If you are not the happy person that you want to be, it is most likely because you have gotten lost in taking care of everyone and everything else around you. You have neglected to take care of ‘you’ along the way. The most simple solution to beginning your Soul Work journey is finding a way to reconnect to yourself. Nature is the most effective tool. Once you have made the commitment to reconnecting with your Soul then the Universe steps in to help. Once the Universe understands and acknowledges that you have fully become a participant in taking control of your life, then it becomes your very best friend. Take that first step, create a new habit. Find a ‘happy place’ where you can just ‘be’ in nature. As you sit or walk or run in this new happy place, begin to listen for the whispers from your Soul. The voice deep within you that will guide you on your new journey. From this place inside of you will come the answers you have been waiting for, to help you live the life that up to now, you have only dreamed about.